THE GIGGLY PIGS WENT TO THE MARKET. 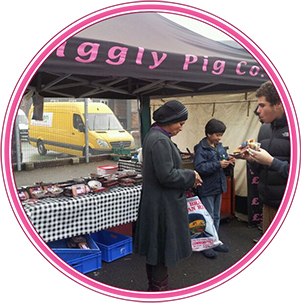 The Giggly Pig Company attend weekly & monthly farmers markets & farmers markets at various locations across South East England. To find out if we're attending any markets near you, just use our sliders below. We're always adding new markets to our ever-growing list so be sure to check back often! Our award winning sausages come in 75 delicious flavours! All our pigs are outdoor reared free-range, rare breed saddleback pigs on our own farm in Romford, Essex.